More than 20,000 fans are enthusiastic about the show. 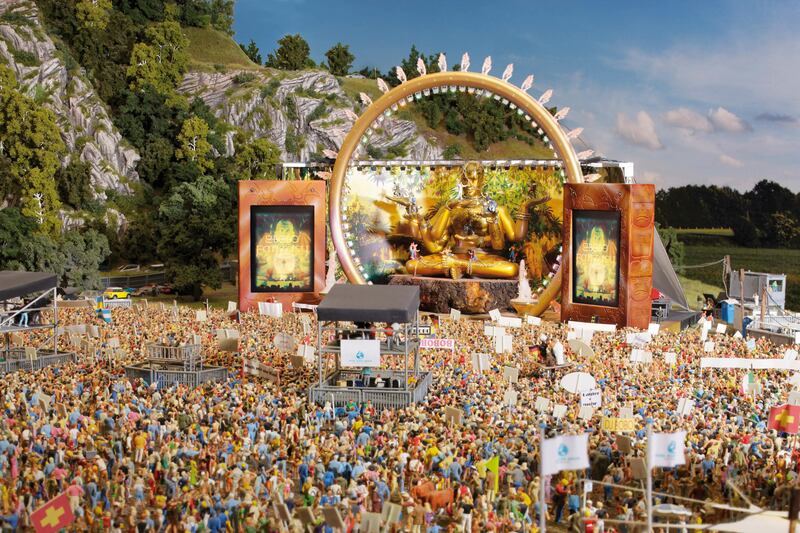 Another highlight is the open air concert with more than 20.000 hand glued little figurines. You can see all the typical impressions of a concert, like for instance the adjoining campground, the VIP section, the GOA chill out zone, the stands for food and beer and of course the waiting line in front of the portable toilets. And most certainly we have some funny scenes here for you as well, like the stall of the vitamin pusher or the mishap of the beer delivery guy. Even in the dark the experience of the DJ Bobo concert is hard to beat. The stage is awash with light and many fans in the audience carry torches and lighters. The biggest crowd is of course gathered in front of the stage, on which DJ Bobo is holding a concert as part of his tour. Aside from the stage design the dancers and the band are in motion as well. At night, when the lights go out, the atmosphere at the festival site is very special. Bonfires light up and the people in the audience in front of the stage pull out their glow in the dark sticks. It took three months to build this area!